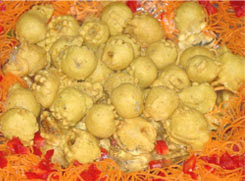 coarsly ground dry fruits like kaju, pista, badam etc. earthern pots to fill ..
all of them get blended with each other.then add dry fruits to it. mix. pour this mixture into the small earthern pots and put them in vertical position in the freezer to set for nearly 5 to 6 hrs. to set firmly. serve it along with the pots ..
Add Cardamom to milk and bring it to boil.Reduce the heat and keep simmering the milk until it is reduced by one-third.Take cardamom out of milk by using strainer. Add almond and sugar.Pour the mixture into container with lid.Freeze until firm. Stir the mixture every 30 minutes.Remove from freezer 10 minutes before serving. Mix together condensed milk, milk, maida, and khoya. Bring to boil, stirring constantly. Reduce heat and cook for 5 minutes, stirring constantly. Remove from fire and cool. Add almonds and kesar dissolved in 1 tsp of water. 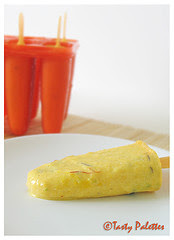 Fill into kulfi moulds and freeze overnight. Peel and pit mangoes. 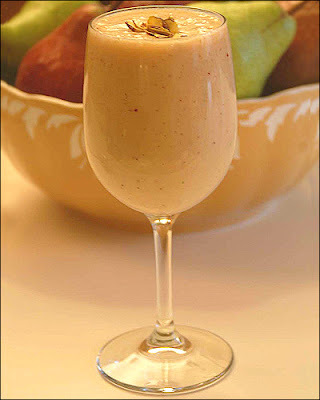 Puree flesh in a blender or food processor. You should have 3-1/2 cups puree. Place mango in a large bowl; add sugar. Stir until the sugar dissolves. 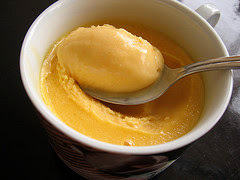 Fold whipped cream into mango mixture. Place bowl in freezer until mixture is half frozen; about one hour. Remove from freezer; beat until smooth. 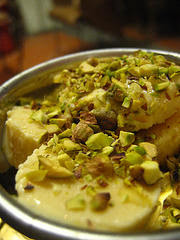 Pack in kulfi moulds and freeze until about half frozen but still creamy. distributing evenly. Cover with plastic wrap or foil and freeze until set, about 6 hours. 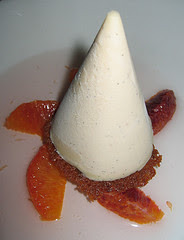 To serve, remove the ice-cream from the molds by running a sharp knife around the edges of the pista kulfi. 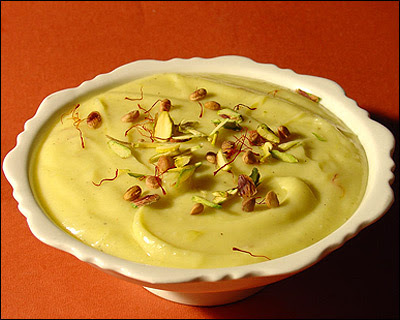 Slip each kulfi on to a dessert plate, cut across into 3-4 slices,top with pista chips and serve. Soak the saffron in a little warm milk and keep aside. Dissolve the cornflour in one tablespoon of milk and keep aside. Boil the milk and let it simmer over medium flame, stirring continuously till the milk reduces to three-fourth little more than half the original quantity. Add the cornflour solution, sugar and bring to a boil. Simmer for five minutes. Cool completely. Add the saffron mixture, cardamom powder and mix well. Pour into a freezer-proof bowl and freeze for about four hours. Remove and blend in the liquidiser to break all the ice crystals till the mixture is smooth and creamy. 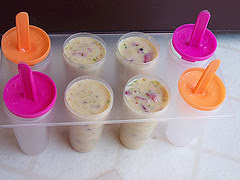 Pour into six kulfi moulds and freeze overnight until it sets. To unmould, allow the moulds to remain outside the refrigerator for five minutes and then unmould by inserting a wooden skewer stick or a fork in the centre of the kulfi and pulling it out. Serve topped with the strawberry sauce. Soak the satay sticks in water for a while.Take paneer, processed cheese, half the green cardamom powder, half the garam masala powder, mint leaves and mix mashing with your hands. Take a portion of this mixture and place on a satay stick and press it around the stick till it is a thin layer. Press the ends firmly.In another bowl mix khoya, chicken keema and mix. Break an egg and add. Add salt, remaining green cardamom powder, white pepper powder and remaining garam masala powder and mix well. Take a portion of this mixture and spread it over the paneer mixture. Similarly prepare the other seekhs. You can keep the seekhs in the refrigerator for some time before frying.Heat sufficient oil in a pan and place the seekhs on it and shallow fry. Turn the sticks when one side is done so that the other side gets cooked similarly.Serve hot sprinkled with chaat masala. Clean, skin, de-bone and cut each breast into two. Grind green chillies, ginger and garlic into a smooth paste. Rub it well onto chicken pieces. Cover and keep aside for fifteen minutes.Hang yogurt in a muslin cloth for half an hour and drain away the whey. Mix thickened yogurt, cheese, cream, nutmeg powder, garam masala powder, honey, lemon juice and salt to taste. Whisk the ingredients well and marinate the chicken pieces in this for three hours in a refrigerator.Place chicken pieces, an inch apart, on wire rack.Cook chicken in Grill TOP and BOTTOM for twenty minutes, brushing with butter every five minutes. Serve hot with chutney of your choice. 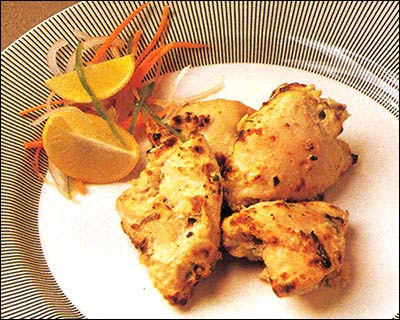 Tip: Use chicken supreme if possible for they make the kebabs succulent and tender. Blanch spinach leaves in two cups of boiling salted water for five minutes. Drain, refresh and squeeze out excess water. Finely chop.Mix spinach, peas and potatoes. Add green chillies, ginger, coriander leaves, chaat masala and salt to taste. Add cornstarch for binding.Divide the mixture into twenty-four equal portions. Shape each portion into a ball and then press it between your palms to give it a flat tikki shape. Heat sufficient oil in a kadai. Deep-fry the tikkis on medium heat for three to four minutes. Drain onto an absorbent paper.Serve hot with a sauce of your choice. 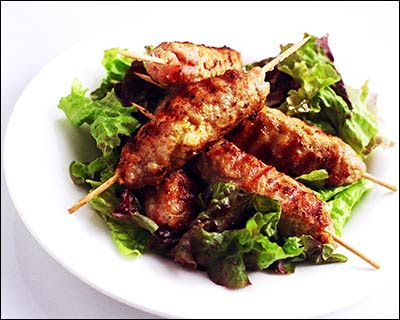 Tip: You may also shallow-fry the Hara Bhara Kabab on a griddle plate or a tawa. It is recommended that you do not use colour in this recipe. If you feel you may increase the quantity of spinach leaves to give a dark green colour. In that case add a little more cornstarch for binding. Peel asparagus and lightly blanch in plenty of hot water for five minutes. Drain and refresh in cold water. Remove the tips and puree the rest.Wash green peas in warm water and puree them in a blender. Mix star fruit with the asparagus tips, add half a teaspoon of chaat masala and set aside for stuffing.Boil milk, remove from heat, cool for a minute and add vinegar. Once the milk curdles, strain in a muslin cloth and press lightly so as to remove the entire moisture. Knead the residue into a fine smooth dough.Heat two tablespoons of oil in a kadai, add cumin seeds and stir-fry for a few seconds. Add ginger paste, garlic paste and stir-fry for a minute.Add half the green chillies, coriander powder and turmeric powder. Stir-fry for a few seconds. Add gram flour and sauté for a few seconds on low heat. Once the flavors of gram flour erupt, add peas puree, asparagus puree and sauté for ten to fifteen minutes on low heat, till the whole thing becomes a mass. Take off the fire and add the homemade cottage cheese.Add garam masala powder, salt, two teaspoons of lemon juice, half a teaspoon of chaat masala and mix thoroughly. Divide mixture into twelve/sixteen equal portions, roll into balls and flatten them slightly between your palms. 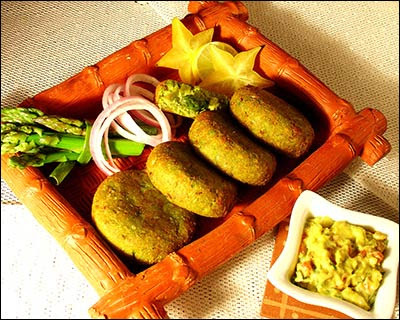 Stuff with star fruit and asparagus mixture and roll into patties. Keep them in refrigerator. 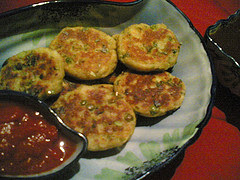 remaining green chillies, salt, remaining lemon juice, remaining chaat masala and the chopped avocados to the avocado puree, mix with a spoon and set aside to chill in a refrigerator.Heat a non stick pan/griddle and shallow-fry the patties in a little oil until both sides are evenly cooked and crisp from outside and soft from inside.Remove in a plate and serve hot with the avocado chutney. 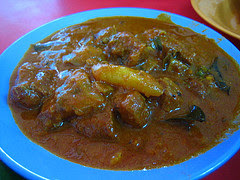 Take mutton pieces in a bowl, add salt, red chilli paste, garlic paste, yogurt and mix. Let it marinate for half an hour to two hours.Heat ghee in a pressure cooker. Add bay leaves, green cardamoms, black cardamoms, broken red chillies, cinnamon, cumin seeds, garlic and sauté for two to three minutes. Add onions and sauté for another two to three minutes. Add marinated mutton and sauté for ten minutes. Add coriander powder, crushed red chillies and mix. Add two cups of water and mix. Put the lid of the pressure cooker on and pressure cook the mutton till done. 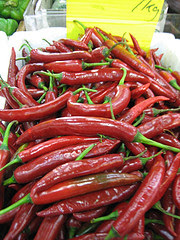 Serve hot garnished with whole red chillies. Take atta in a bowl. Add salt, baking powder and half a cup of desi ghee. Mix well. Add sufficient water and knead into a stiff dough. Preheat oven to 180°C.Take lemon sized portions. Press firmly and roll into round balls.Grease a baking tray. Place the baatis on it. Press them slightly. Place the tray in the preheated oven and bake at 180°C till done. It may take fifteen minutes to half an hour. When done, serve it hot with a bowl full of pure ghee to soak baatis and Rajasthani dal. if u dont hv oven u can deep fry in oil or ghee..
Soak moong dal and chana dal together in about three cups of water for an hour. Drain. Boil dals in four cups of water adding salt, turmeric powder and ginger till cooked.Heat ghee in a pan. Add cumin seeds, asafoetida and red chillies and as cumin seeds begin to change colour, add onion. Cook till onion turns light brown. Add red chilli powder and cooked dal to this. Add half a cup of water and bring to a boil. Reduce heat and simmer for ten minutes. Add amchur and adjust salt. Mix well. Heat a pan with oil & add the onions. Fry till translucent. Add tomatoes,salt,add all the powders and fry till the oil floats on top. Boil all the other vegetables seperately & add them to the onion mixture. Add a cup of water & let it cook to boiling consistency. Then With the help of a potato masher keep mashing the mixture till it cooks nicely. When all the vegetables are cooked thoroughly garnish with coriander & lemon juice and serve with Pav. Slit open the pavs from the middle. Apply butter in the inside & place them on a pre-heated frying pan.When they get golden brown from the inside take them off. Cut Paneer into long 1/2" thick cubes. Cut all vegetables into cubes. Mix all ingredients for marinade and keep aside. Add the left marinade to the vegetables. Brush the marinade to the paneer and refrigerate it for 3 hours. Heat oil in a kadhai and fry marinated paneer till fully done. Also fry other vegetables. In a plate arrange fried vegetables and then paneer. 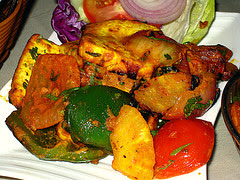 Garnish with coriander and lemon slices.Serve tandoori paneer tikka hot with hari chutney. Serve individually taking 2 scoops of cooked peas and cover with little chopped onions, cucumber. tomatoes and potatoes. Sprinkle with spices to individual taste. Pour a little tamarind & green chutney and lemon juice on the top. Cut the potatoes into strips of about 1/3 to 1/2-inch thickness and width Soak potatoes in ice cold water for 1 hour at room temperature. Drain well; pat dry with paper towels. Heat oil in deep fryer to about 375°. Place potato strips in a single layer in deep fry basket; fry in hot oil for about 4 minutes, or until golden brown and tender. 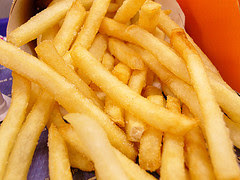 Drain the homemade french fries on paper towels then keep warm in the oven while frying remaining batches. In a bowl add gram flour (besan), Curd and water. Mix well and make a smooth batter. The batter should be of thick consistency. Add salt and set aside for 4 hours covered with a lid. Take the ginger and green chili paste and add to the batter. Also add turmeric powder and mix well. Keep the steamer or cooker ready on gas. Grease a baking dish (it should fit in the steamer or cooker). Now in small bowl take a tsp. of soda bi-carb or eno, 1tsp oil and lemon juice and mix well. Add this to the batter and mix well. Pour the batter into the greased pan and steam for 10-12 minutes or till done. Cool for sometime and cut into big cubes. Heat little oil in a small pan and add mustard seeds and curry leaves allow to splutter. Remove,add 1/4 cup of water and pour it over dhoklas. 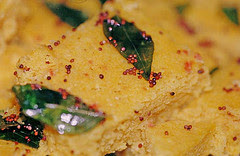 Garnish the besan dhokla with coriander and slited green chilies. Serve with green chutney. Clean, wash and soak the daal overnight. Grind it into smooth paste. Add salt to taste. Heat oil in a pan and drop a spoonfuls of batter and fry till golden brown. Take the hot vadas and put in cold water for 2-3 minutes. Now Take them out of water and squeeze the water and keep aside. Blend the curd (yogurt) and little water until it is smooth. Keep in refrigerator for an hour to get chilled. Add salt, red chili powder and cumin powder. 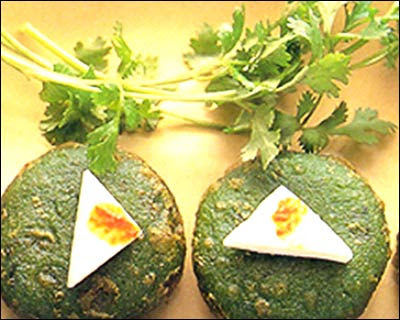 In a deep dish arrange wada and pour dahi over them. Now add imli (tamarind) chutney and green chutney. Garnish with coriander. Soak the dal in water overnight then rinse and drain. Sift the flour and gradually add enough water to make soft dough. Cover the dough with damp cloth and leave for 30 minutes. Grind the dal with the chili powder, salt and spices to make stuffing. Mix well and divide it into 16 equal portions. Divide the dough into 16, using wet hands, and smear each portion with a little oil. Flatten and roll out into 2inch round. Wrap one portion of stuffing in each round and roll into a smooth ball, using greased hands. Flatten and roll into a 3-4 inch round. Heat plenty of oil in a deep frying pan or a kadhai. Now lift the rolled kachori and carefully slip it into the hot oil. Immediately start flickering hot oil over the top of it with a spatula so that it will swell up like a ball. This should take only a few seconds. Flip the kachori over and cook the other side until golden brown.Serve the dal kachori hot with chutney. Take all ingredients and mix well. 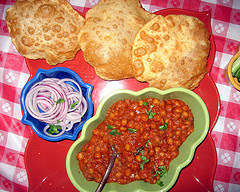 Make a soft dough like for chappatis. If need be add a little water and keep aside for 4-5 hours, the longer kept, the better it is. Roll like puri but this needs to be kept thicker than poori. 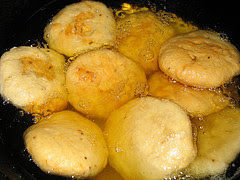 Fry like poori till both sides are golden brown. Take 2 tablespoons of oil in a pressue cooker and heat it. Add garlic and make it dark brown. Then add cumin seeds fry till they start spluttering. Now add bay leaves and cloves. Add diced onions. Fry then till they are light brown. Now add the rest of ingredients including water except mint leaves. Close the pressure cooker and wait for 3 whistles to come or cook for 5-7 minutes. Garnish choley with thinly sliced long pieces of onion and a piece of lemon split up into 4 pieces. Add salt, chili powder, gram masala, green chilies and coriander leaves to the mashed potatoes, mix well Take some water in a bowl and dip a bread slice for few seconds. Squeeze the water from the bread by pressing between palms gently. Place a tbsp potato mixture over the damp bread and roll and seal the edges of the bread in such a way that the filling does not come out from any part of the bread. Repeat the same process for making more rolls. 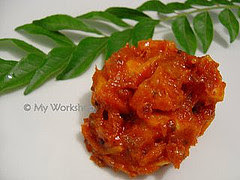 Heat oil in a kadhai and deep fry on medium flame till golden brown. 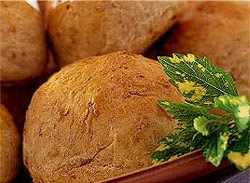 Serve bread rolls hot with green chutney and tomato sauce. Cut Bread slices into desired shapes (like triangle, rectangle etc.) In a bowl add gram flour salt, chili powder, garam masala, ajwain and mix it. Now by pouring little water at a time make a smooth batter (neither too thick nor too lose) Heat oil in a kadhai. 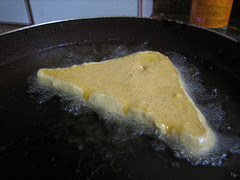 Dip bread piece in the batter and fry till crisp on medium flame. Serve bread pakora hot with green chutney and tomato sauce. Take the cooked or defrosted peas (matar) and mash them using a spoon or a fork. Add all the stuffing ingredients except oil and mash briefly. Divide the mixture into 10 equal portions and keep aside. Peel the potatoes and mash them very finely into smooth mashed potatoes. Add salt and pepper and knead until properly mixed. Divide it into 10 equal portions. Now wash and dry your hands and rub them with little oil. Take each portion of potato mixture and make a ball. Now Taking one at a time, gently flatten each ball into a round patty of about 1/2-inch thick and place a portion of stuffing in the center and fold the edges together very finely so that mixture does not come out. Now very gently flatten it into a 2-inch patty. Repeat the procedure for all pieces. Heat 1 tsp. oil in a non-stick pan over a low heat. Slip in the patties, not too many at a time, and pan-fry on both sides till crisp golden brown, adding oil if required, on a very low heat. Serve aloo tikki hot with chutney and stirred curd. Dice aloo (potatoes) into a fairly large dice - 3/4 to 1 inch cubes. Heat oil in a wok and deep fry potatoes, till golden brown and cooked through. Drain on paper. 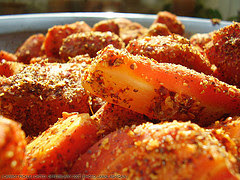 In a bowl, place the fried potatoes and toss with red chilli powder, cumin powder, chaat masala. Add mint chutney, tamarind chutney according to taste and toss to coat evenly. Serve, in individual bowls, garnished with coriander leaves. 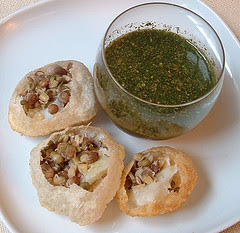 Serve aloo bonda hot with chutney. Mix sooji, maida, baking soda, salt and enough water to knead a soft dough. Stand covered with wet cloth for 15-20 minutes. Make small sized balls. With the help of some dry maida or sooji, roll into thin rounds. 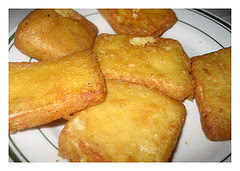 Heat oil in a pan and deep fry puris till very light brown and crisp. Drain in a paper towel for a while to dry out the oil. Store in an airtight container when cool. 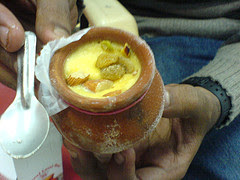 Pour beaten curd in each puri. 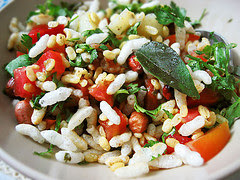 Mix the puffed rice, tomatoes, onions. Drain the water from the grated potatoes and mix that as well. Mix all the ingredients under seasoning and add to this. Lightly crush and add the nimkis and golgappas. Add the sev and kaara pusa directly and mix well. Finally garnish with coriander leaves and lemon juice. Remove the stems of the chillies and then the seeds from the stem side carefully with the back of a hair pin. Wet all the ingredients with lemon juice and a little oil. Fill the masala tightly in the chillies and pack them in a jar. Pour the oil over them. Keep for one month. Shake the jar carefully every 2 or 3 days. 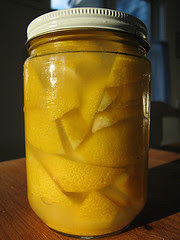 Cut the lemons into eight pieces each, rub salt and keep for one week in a jar. Shake daily. 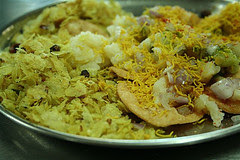 Heat the oil in a pan, remove from the fire, cool a little, add crushed asafoetida and mustard seeds and cover the pan. Cool a little, mix lemon pieces, lemon juice, fenugreek powder, chilli powder and sugar. Keep for one week before serving. Peel the brown layer from the onions. Slit into four, keeping intact at the base. Rub 7 teaspoons salt on the onions and keep for 4 hours overnight. Heat the oil till smoky and cool. Throw the water of the onions and wet all the ground ingredients with lemon juice and 1/4 cup of oil. Fill the masala in the onions and pack in a tall jar. Then pour the rest of the oil over them. Put 1 teaspoon salt on top and keep aside for 12 days and serve. 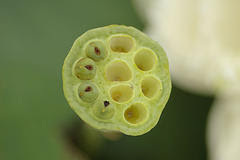 Peel and cut lotus stems into round slices and boil till half tender. Put it on a strainer till dry or keep it in the sun till quite dry. Mix salt, red chili pepper, mustard powder and turmeric together. Rub over lotus stem pieces. Put the pickle in a jar and on it pour heated and cooled oil. Keep it for 4 days before serving. Remove the ends, head and tail of each Lady finger and slit on one side. Mix salt with all the ground spices and wet with a little juice. Fill the spices in the Lady fingers. Heat the oil and fry curry leaves and bing for one minute. Remove from the fire, put Lady fingers and the rest of the lemon juice and 4 teaspoons salt. Cook till it boils. Cool, put an airtight jar. Keep it for 3 days, then serve. Boil the water in 2-litre saucepan. Add carrots and blanch for a minute. Drain the water and then spread carrots on a clean cloth and sundry In a bowl mix the mace, cloves, cardamom, salt and jaggery. Add the carrots and toss to mix. Transfer to a sterilized glass jar. Pour the mustard oil into a small saucepan and place it over a moderate heat. As soon as oil begins to smoke remove it from the heat and cool it for 4 minutes, then pour it into the jar and cover it with a clean cloth. 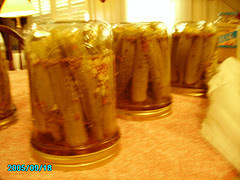 Set the jar in sunlight for 13-14 days, bringing it indoor evrynight. Shake the jar two or three times daily. Boil the dates until a little tender. Remove the stones and keep them whole. Dry with a clean cloth. Mix all the ground ingredients together with a little salt and fill in the dates. Keep the dates in clean jar. Mix a little salt with lemon juice and pour over the dates, taking care that dates must be covered with lemon juice. Keep aside for 7 days. Wash, peel and grate the mangoes. There should be about 450gms of flesh. Add sugar and salt and mix well in a large bowl. 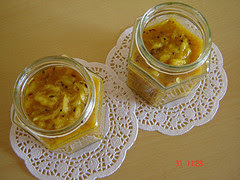 Roast cumin seeds, cardamom seeds and poppy seeds, stir in chili powder and mix with the sweetened mango. 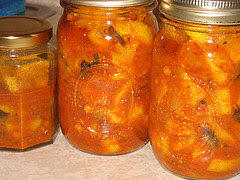 Turn the mango pickle into a sterilized jar, cover with a clean cloth and leave out in the sun or in warm, light place for about a week. Shake the jar at least once a day. Slice the onions and capsicum for topping into thin round slices. Keep aside. Heat butter. Add chopped onions. Stirfry for 2-3 minutes. Add tomato puree, bring to a boil. Pound together garlic, chilli powder, salt, clove-cinnamon powder. Add all ingredients except cornflour, simmer for 5 minutes. Mix cornflour in 1/2 cup water to make smooth paste. Add to the boiling sauce, stirring continuously to avoid lumps. Stir and cook till thick enough to spread on pizza bread. Cool, stirring occasionally, to avoid surface from drying up. Spread a ladleful of pizza sauce on the bread. 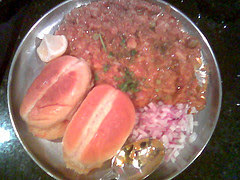 Arrange slices of onions and capsicum over the sauce. Sprinkle coriander and cover with grated cheese. Bake in a hot oven, for 5 minutes or till cheese melts and base becomes crisp. 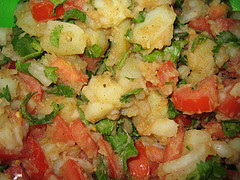 Chop potatoes, tomatoes, and onion into chunks. Cool, blend in a mixie, strain, keep aside. Heat butter, add cabbage, onion, carrot, spring onion, stir fry for 2 minutes. Add stock, boil for 10 minutes. Add paprika, salt, sugar, sauce, macaroni, spaghetti, mix well. Transfer to serving bowl, sprinkle grated cheese. Pressurecook, peel, mash potatoes.Add 3 tbsp. cheese, salt, pepper, butter, nutmeg powder.Heat a heavy omelette pan, add olive oil.Press the potato mixture into pan. Heat on low flame till base is golden brown.Invert carefully with a wide spatula. Roast the other side similarly.Sprinkle remaining grated cheese on top. Grill in oven to melt the cheese before serving. 1. 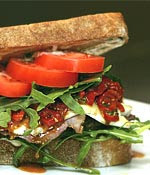 Soak white bread slices in half cup of water for five minutes and squeeze out extra water. 2. Put the bread in the blender. Add garlic, tomatoes, cucumber and chilled water and blend. 3. Add green capsicum and salt. Blend again. 4. For sourness add wine vinegar or malt vinegar or lemon juice. Add olive oil and continue to blend. 5. 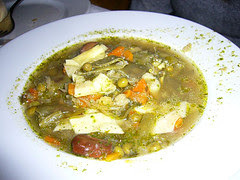 Strain the soup into a bowl. Chill again. 1. Peel mangoes, remove seed and cut into half inch pieces. Boil five cups of water in a pan, add salt, turmeric powder, half the sugar, mango pieces and blanch. 2. Heat oil in another pan. Add cumin seeds, fennel seeds, onion seeds and asafoetida. Sauté till a nice aroma is given out. 3. Drain the blanched mango pieces and add to the pan. Add the remaining sugar, adjust salt and mix well. 4. Do not cook for long. Remove from the heat and serve immediately. 1. Cut carrots, white radish and cucumbers into finger-sized pieces. Cut each red radish into quarters. Wash lettuce leaves and soak in chilled water. 2. Reserve some mint leaves for garnish and chop the remaining. 3. Hang yogurt in a muslin cloth to remove excess water. Combine yogurt with chopped mint, lemon juice, sesame seeds and garlic. Mix thoroughly. Add salt to taste and place in the refrigerator to chill. 4. Just before serving, drain lettuce leaves and spread on a serving plate. Arrange the prepared vegetables decoratively and serve with the chilled dressing. 1. Peel bottle gourd, cut into half, remove seeds, wash and then grate. 2. Heat ghee in a kadai, add cashewnuts and sauté till lightly browned. Drain and keep aside. Add bottle gourd to the same ghee, sauté for few minutes and keep aside. 3. Bring milk to a boil, then simmer till it is reduced to three-fourths and add the bottle gourd. Stir to mix well. Cook till done. 4. Add sugar. Cook till sugar dissolves and kheer is semi-thick. Mix in green cardamom powder and kewra water. 5. Pour into individual serving bowls, garnish with browned cashewnuts and serve hot or cold. Mix the chopped onion, tomato, potatoes, green chillies, boiled corn, half the quantity of cheese, salt and pepper in a bowl. Lightly toast all the bread slices, then butter one side of each slice. 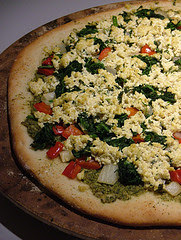 Spread the vegetable mixture onto the buttered side of every slice, and sprinkle the remaining grated cheese on top. Drizzle the slices with tomato and chilli sauce, and bake them at 350 degrees Fahrenheit or 160 degrees Celsius for 10 minutes, or until the cheese melts. Clean the chicken and boil it in a saucepan full of water, along with the onion, garlic paste, ginger paste, black pepper, cloves, cinnamon and salt. Cover the saucepan within which the chicken is boiling, and in a separate bowl, thoroughly mix the mayonnaise, grated cheese, butter, salt, sugar and pepper, till a smooth paste is obtained. Once the chicken is well cooked, strain off the stock (it can be used to make clear soup). and shred it well. Add the shredded chicken to the mayonnaise batter. Using a butter knife, spread the chicken and mayonnaise onto a large slice of bread, and place another slice on top. Your chicken sandwich is now ready to eat -- the sandwich can even be grilled, if desired. Serve with ketchup.